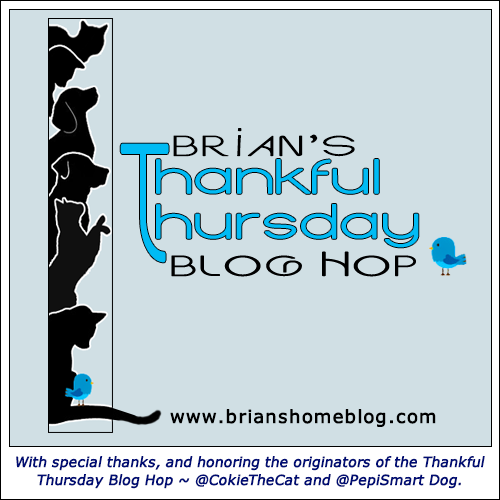 Welcome to our Thankful Thursday Blog Hop, I hope you know how happy we are when you stop by for our Blog Hop. Each and every Thursday we tell everyone about the things for which we are most thankful and today we do just that. We really do get excited when we see new blogger pals hopping in for the first time too and your thankfuls always make us smile! Today, once again, I find myself saying thank you for all of your kindness sent our way with the passing of our beloved Sister Gracie. Thank you for all of the comments, emails and eCards, they mean the world to us. Her departure has sure left a big hole in all of our hearts. This one really did hit me hard, there’s a disturbance in the force that we all feel. My regular eating spot is close to where Sister Gracie always ate. I haven’t wanted to eat my meals much, it’s just not right. The Dad tried moving my regular eating spot to a new location, but that’s just not right either. I’m starting to eat again but dang, I miss that girl. Just nine months ago there was nine of us, now there is six. Three Angels so quickly is just too much, but we’ll all go one with our new normal, it’s what our dear Angels would want. 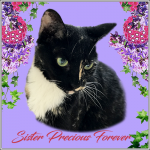 So now we will celebrate the happiness that Sister Gracie brought to us each and every day and our hearts will smile as we remember the joy she brought to our home. 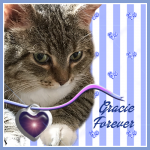 We are truly thankful that Gracie was a part of our lives and we’re thankful for all of your support and love. Brian, we know it will just take some time. Some folks think that cats don’t feel stuff, but we know better (and your family does too). We feel things very deeply, and like humans, we all recover differently. We’re glad you’re back. I’m always thankful for you, Brian. I’m thankful for your five fursibs too and most thankful that I knew and loved Gracie. Of course things are so very different without sweet Gracie there. Brian, we are so sorry your family has gone through so much loss these past months. That’s just no right. But we are thankful for you, and that you all have each other, and that you are surrounded by love and friends. Oh Brian, we know ‘zactly how ya’ feel, tryin’ to do normal when it isn’t normal. We’re sendin’ lots of hugs and purrayers fur all. And, ifin ya’ll need anythin’, mommy says to holler. We miss Gracie too. We’re so thankful for special friends like you. We know it has to be hard with the reduction in your numbers this past year. We’re sending positive thoughts and lots of purrs. Brian, I understand how difficult losing siblings is. Last year, I lost both of my bunny brofurs and then Mr. M this past April…. I’m still not over the wrenching void in my life , but ever day gets a little bit easier. We are thankful that the cat blogging community is a caring and supportive one. We purr you will feel better soon Brian, but getting used to Gracie’s empty spot will take time. Cats sure know when things are different indeed. Remembering that happiness sure is the way. New normals are difficult and hard to get used to. Purrs to your family, Brian, and to you. This is so sad. I’m so sorry. We are so sad for you all as three loved ones leaving is too much. You will all find a new normal, and Simon will keep everyone on their paws I’m sure. GBGV hugs to all of you whether you want them or not because of the dog smell. We are just thankful to have all of you as our friends. Animals do grieve and Brian we sure feel for you missing Gracie. We know she is watching over you from heaven. Try to have a good day. We are Thankful that we got to know sweet Gracie and that you are our friends. Our hearts are still aching for you with the loss of sweet Sister Gracie but of course she and your other Angels are there – always there…your new normal will feel more “right” as time passes. Meanwhile, know that we all have your back! So much sadness lately in your family, Brian. We know things won’t be the same. Sending you all comforting purrs. There really have been so many losses in your family recently. Each and every one of them is hard to take, but all together, that’s an awful lot. We are thankful for every good meal, every snuggle, and every sunpuddle. We’re thankful you have such wonderful human caretakers, Brian. Our purrs and nose taps to you all. Dear Brian and family, our hearts ache with yours, and we know it’s a blow to the whole system. But Brian, you’ve got to eat and live, so we are hoping that you’ll find a way to enjoy your noms again. Brian, you and your entire family have constantly been in our thoughts and prayers. Your angels are watching over all of you. They will help you learn the ropes of life without them on this earth, but they will still always be with you. it’s so hard when they leave us. It really does leave a huge hole in our lives and hearts. I’m thankful you had Sister Gracie for all the time you did. Life wouldn’t have been the same without her. We also know how hard it can be to lose a sibling…we are so thankful we got a chance to know Gracie. 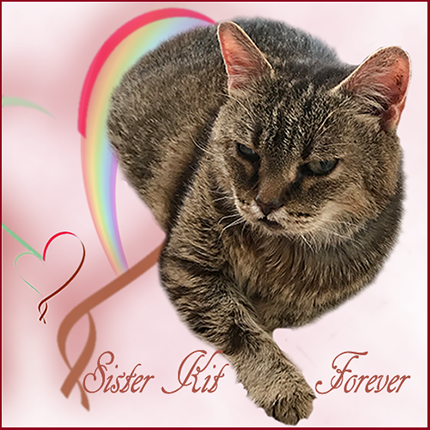 I’m sure nearly all of us have had at least one cat go to the Rainbow Bridge. Big hugs! Brian it is hard to go on when one of our family members is gone. It’s OK to be sad. It’s actually what everyone feels for a time, some more than others. WE know you will find your happy again one day. 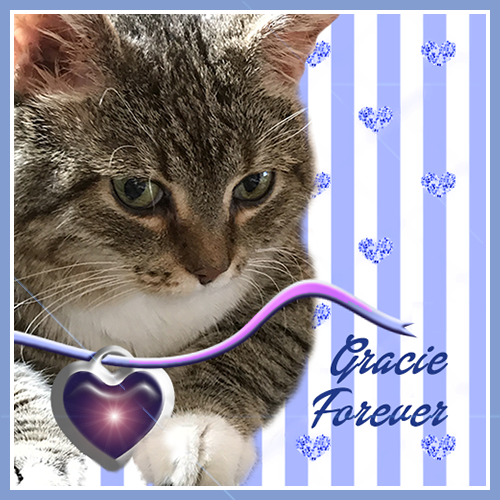 We all miss Gracie and we know everyone in your household does too. Thinking of you. You have had to endure so much loss. Three in such a short time is tough. But then again, losing one at any time is always hard. We are so sorry about Sister Gracie and we know that it is going to take some time for all to adjust. We hope Brother Simon will find good ways to keep you all smiling. Hugs from all of us. Oh you sweet babe, it is never fun when there is a disturbance in the force esp when it when you lose someone you love. Time and time again I say I am thankful for my furbabes and I am….but today being able to feel pretty good with not so much pain I was able to work in the yard since the humidity was not bad ….so today I want to say I am thankful for feeling good, less humidity and for retirement that allows me to do these things through the week. 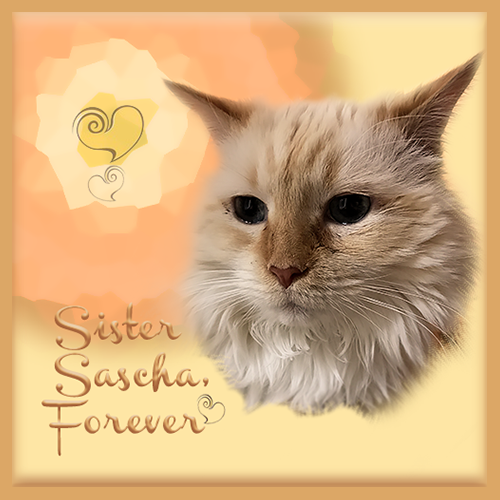 I’m grateful for our loving compassionate CB community of furriends. They make the wrenching sadness a bit easier to bear. And they never mind when we talk of our loved ones. NO matter how many times we need to. 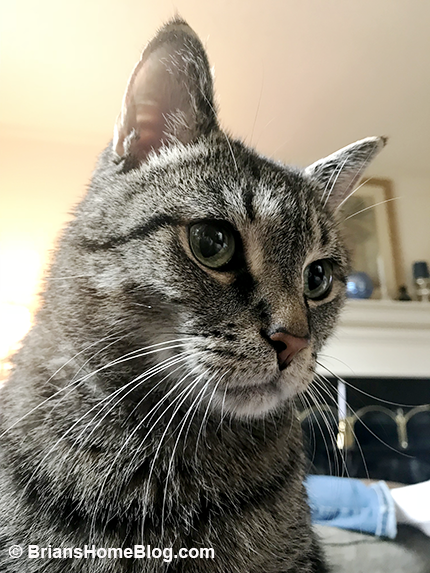 We are thankful that we have met so many wonderful people and their furry family through the blog, people like you, and Miss Gracie (which was my Mom’s name). Bless you in the days ahead. I am thankful for your wonderful and inspiring spirit. You are doing as Sister Gracie would want. Please keep eating, Brian. I’m so sorry that you’ve had such terrible losses this year. I am sending you POTP for your spirits. Someone one said losing their cat hurt more than a beloved parent. This could be true, I know we will miss Gracie and know you fought her corner with a quiet fierceness and determination. She will be missed, but never EVER forgotten. I love a rescue buddy Hobart today, I know he will meet Gracie up there. Bless you Brian and family. That is a lot of loss so quickly. I’m glad you’re starting to eat again. I know your parents take wonderful care of all of you. Hugs!